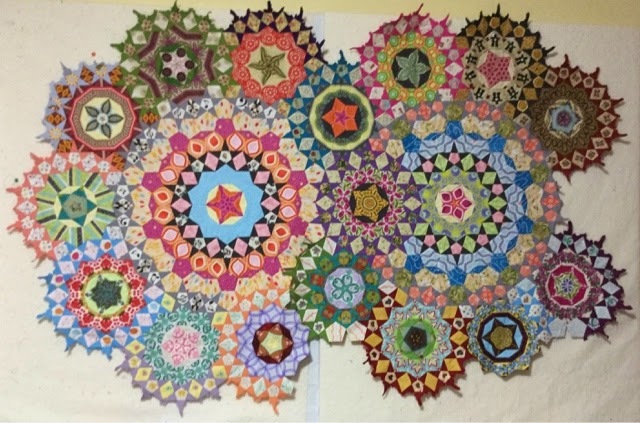 I am still working away at getting La Passacaglia, a design by Willyne Hammerstein in her book Millefiori Quilts, sewn together. I just have the green rosette with the owls, in the centre at the bottom, left to stitch into place, and then I can start making more rosettes. I put a strict ban on myself, not allowing the beginning of any more rosettes until this was all stitched together. So close.......... I can soon start turning more fabrics into swiss cheese by having all kinds of fun fussy cutting. When not working on this, I've been working at the long arm. I had a couple of quilts that were needed by the beginning of June. Considering their summer schedules, and mine, it was a bit of a rush to get them done. The last of them went home today. So, I can start taking it a bit easier now. Due to that schedule, there hasn't been a lot of stash reduction happening. Just the fabrics for two of the rosettes in this project that were finished. I don't think there will be much stash busting this week, either, considering we are heading out in the trailer for five days over the weekend. We're heading out to an area of the province we haven't explored much, and will be staying at Rock Point Provincial Park. I now have a blogging app on my iPad, so I hope to get a couple of posts done while we're away, telling a little about our travels. I might, just maybe, see if there is a quilt shop, or two, in the area. I'm going to link up to Judy's Fabric report and also to her Design Wall Monday. I'm a little late for it, but I'll also link up to Kathy's Slow Sunday Stitching. I didn't actually get to do any stitching yesterday until late in the evening. Most of the day was spent outdoors working on getting some planting done. However, I didn't get all that much done, in spite of spending most of the afternoon at it. My stamina for physical exercise is way down. I had to keep stopping to sit down and catch my breath. It was such a long winter, without much activity. I'm way out os shape. I think I'll post this, grab La Passacaglia and some reruns on netflix, since the alternative is hockey. Those "Millefiori" are amazing. I keep looking from one to the next. Wonderful eye candy. Oh my - La Passagalia is looking spectacular!!!! ENjoy your camping and stitching in the great outdoors! Wow! La Passagalia is stunning!! Looking forward to seeing your progress on this beauty. I have been looking and looking for her book - where did you find it? La Passacaglia is fabulous! Have a fun break. That is amazing! Kudos on your workmanship....I just keep looking at each rosette and moving to the next one....stunning!